This week the PGA has the Honda Classic, which takes place in Florida. This tournament has quite the history – founded in 1972 and back then it was known as the Jackie Gleason Inverrary Classic. Of course sponsorship took over, and it’s been sponsored by Honda since the early 80s. It has taken place at different places over the years, however always in Florida and has been at the Palm Beach Gardens in Florida, on the PGA National Golf Club Champion Course, since 2007. There’s been different winners every year when on this course, featuring the likes of Rory McIlroy, Camilo Villegas, Michael Thompson and last years winner Russell Henley. It should be a great tournament, and Rory is – no surprise – a heavy, heavy, heavy favourite. 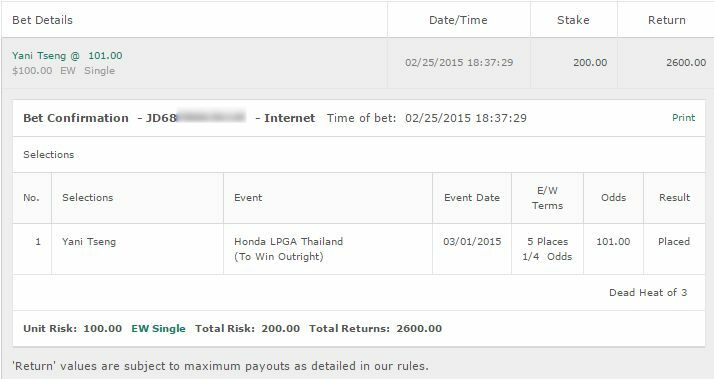 Brooks Koepka is also 33/1. All odds for the Honda Classic 2015 courtesy of https://www.GTBets.com. 25/1 odds, but Bradley is coming into this one after a nice 4th finish at the Northern Trust Open. He’s not exactly dominated this course. But his last 3 finishes here have all been solid. Twice he has been just 1 stroke away from a top 10 finish, and he did come 4th here 3 years ago. Unfortunately, Bradley is not a consistent golfer either. You see it often – a golfer who will come in the top 10 or 5 will flow even better the next tournament they participate in. Bradley has not shown that in the past few years. So we will go with a half unit bet on Bradley although we wouldn’t knock a quarter unit bet either. Bet: Bradley E/W 25/1 at https://www.GTBets.com. The 2006 winner of this course, he has had a hellish season thus far in the events he has participated in, not making the cut multiple times. However Donald has had MULTIPLE great finishes on this course, and came 8th last year after skipping it the previous two years. He’s 80/1, but we recommend a bet on Donald here for sure. It’s up to you how many units you want to risk on this one – he’s someone that has the capabilities to get a top 5 finish, but also could not make the cut just as easily. Bet: Luke Donald E/W 80/1 at https://www.GTBets.com. We actually got on him earlier in the week when he was 30/1. He’s drifted down to 22/1 but is still worth the bet at those odds. Rose hasn’t played much this season, but he has a good history here. He didn’t play the Honda Classic in 2014, but he had a 5th place finish in 2012, 4th place in 2013, and a 3rd place in 2010. We all know Rose and his capabilities and he’s got the skill to push Rory the whole way. 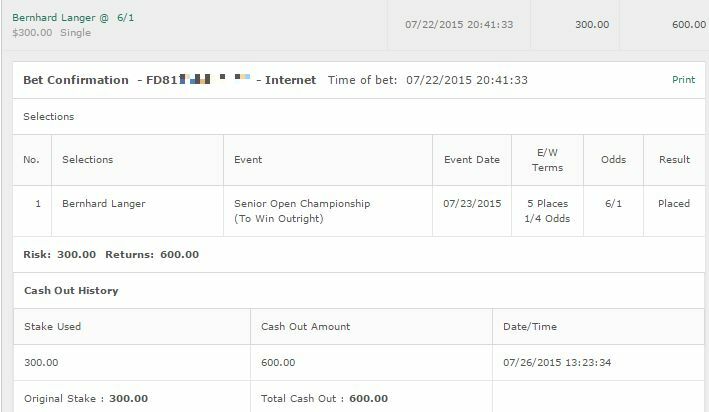 Bet: Justin Rose E/W at Bovada for Americans. You know what’s sad? 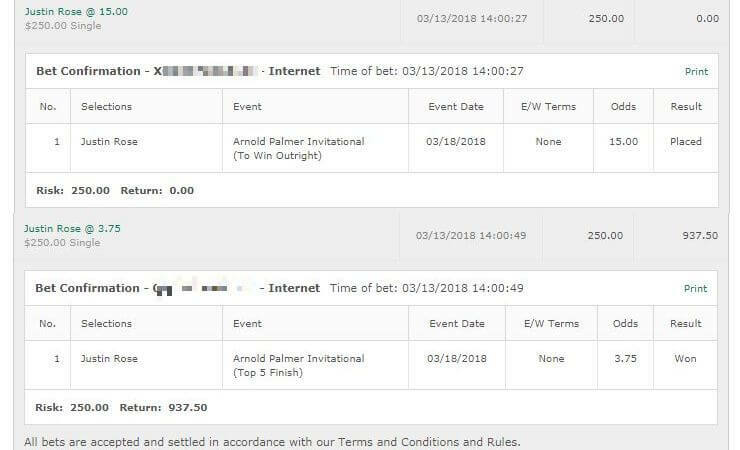 A lot of people actually bet Rory McIlroy at those odds. And he drifted even further, to 7/4. Insane. We came very close with Luke Donald. A massive 80/1 he came tied for 7th. 2 more strikes less and that 80/1 would have came in big time. His consistency showed up here and if not for Round 3 where he had a disaster and shot 4 over par – man.